When it comes to spotting car trouble you shouldn't rely on just the dashboard indicator light. While your vehicle is fairly good at detecting issues before you are, there are still some problems in which human senses will be faster than the car's computers. If you ever suspect car troubles be sure to visit your local auto repair shop, especially if you encounter any of these indicators of a possible breakdown. As mentioned, your car does a great job of informing you about problems that occur inside the engine and other vehicle systems. If the check engine light, ABS light, battery light, temperature light, TPMS light or any other warning light illuminates on your dashboard, be sure to get to the repair shop for proper diagnostics and repairs. A common external sign of trouble for any make or model is a leak. 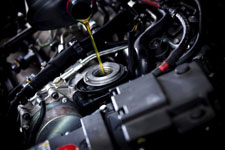 The most common fluid leaks are oil leaks, transmission fluid leaks, coolant leaks, power steering fluid leaks, differential leaks and brake fluid leaks. If you spot any sort of liquid leaking from your car do not hesitate to have it checked out. Have you noticed that you're spending more time at the gas station? Is your vehicle having trouble accelerating or suffering from a rough idle? Performance issues, including a decrease in fuel efficiency are a clear indication that there's trouble brewing. Any time that you hear an odd noise coming from your car or truck be sure to visit a mechanic for further diagnostics. Common noises that indicate trouble include squealing while braking, grinding while shifting or a repetitive knocking noise that that originates from under the hood, inside the engine. An increase in exhaust smoke is a sign of engine trouble. Based on the color of the smoke you can usually figure out what the problem is. Black smoke indicates excessive fuel burning, white smoke is a sign of coolant in the combustion chamber and blue smoke means that oil is burning up. Don't hesitate to bring your vehicle to an auto repair shop if you believe it is suffering from any sort of trouble. The longer you wait, the worse the problem will get, which translates to more expensive repairs. If you need auto repair in Sacramento give Freeport Automotive a call at (916) 389-2405 to schedule an appointment. Our full service Sacramento auto repair shop is staffed by professional technicians who are excited to help you keep your car running its very best.